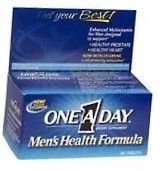 Enhanced multivitamin for men designed to support: healthy prostate, healthy heart. Now with lycopene, a cell protecting antioxidant. KEEP OUT OF REACH OF CHILDREN. This product is not intended to diagnose, treat, cure or prevent any disease.